As our appetites have grown so have the sizes of our dishware. According to an article in the Journal of the American Association, plates have grown in size by 22 per cent since 1960. That is about a third more space to pile on with extra calories. 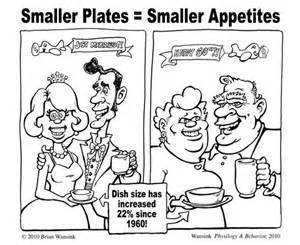 Perhaps its no coincidence that the rise in obesity coincides with the rise in dishware size! Simply put, we tend to eat with our eyes. Even nutrition experts, when given larger bowls, ate 31 per cent more food without even being aware of it. The size of our dishes helps us estimate what a normal portion should be. If we are used to filling a dish half way, we will likely do so despite the size of the dish! You will have guessed that the portions are the same. The one on the right might look smaller because of the plate size. But is the size of the dishware the only culprit? 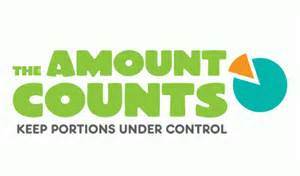 Well, it contributes but just as important is PORTION CONTROL. the amount of food seem like more, but will make it easier to choose smaller portions. 2, Serve food in appropriate portion amounts and do not go back for seconds. 3. Never eat out of a bag or packet. more than they realize, and the calories mount up. 5. Choose foods packaged in individual serving sizes.